TABLEAPP bring you more recommended restaurants with your reservation mail! 12 September 2013 Categories Development, TableApp Ideasbest restaurants, development, TABLEAPP, TABLEAPP.comLeave a Comment on TABLEAPP bring you more recommended restaurants with your reservation mail! We recently implemented a new section in our email. The recommended restaurant is now added to the lower section of the email. This section introduces you about other restaurants that are famous you may like. To view the restaurant, you can click on the light blue 'View Restaurant' button and if you want to book a table at the selected restaurant right away, you can click on the orange 'Book A Table' button. you may also visit our TABLEAPP online reservation website to see more restaurants. 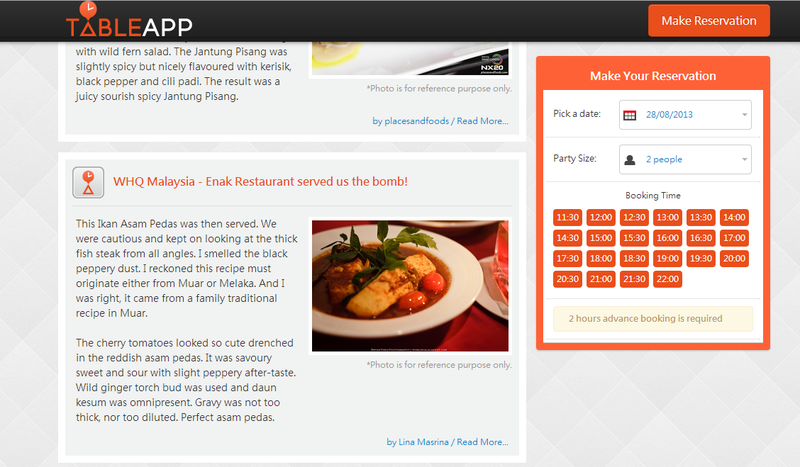 TABLEAPP restaurant page has a brand new look to it! 27 August 2013 28 August 2013 Categories TableApp, TableApp IdeasTABLEAPPLeave a Comment on TABLEAPP restaurant page has a brand new look to it! 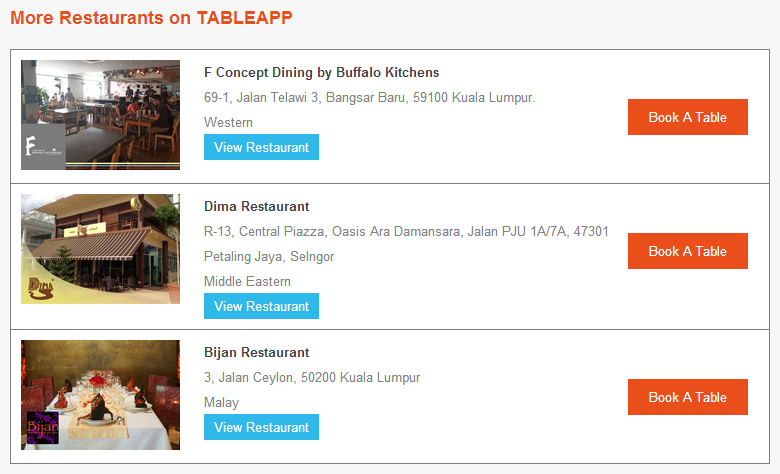 TABLEAPP online reservation has a brand new look to it with multiple newly added features! You can now browse through our restaurant with some blog articles as references to the particular restaurant. This can give you a overview of what food the restaurant offer and the overall taste of it. 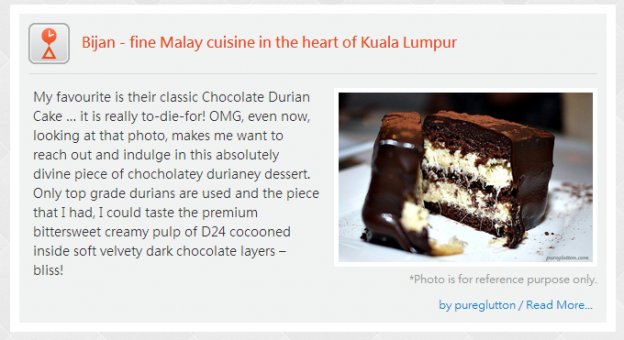 Through this blog article, users can click on the read more button to see the full blog article posted by bloggers who have been to the restaurant before. You can also find food review photo here. 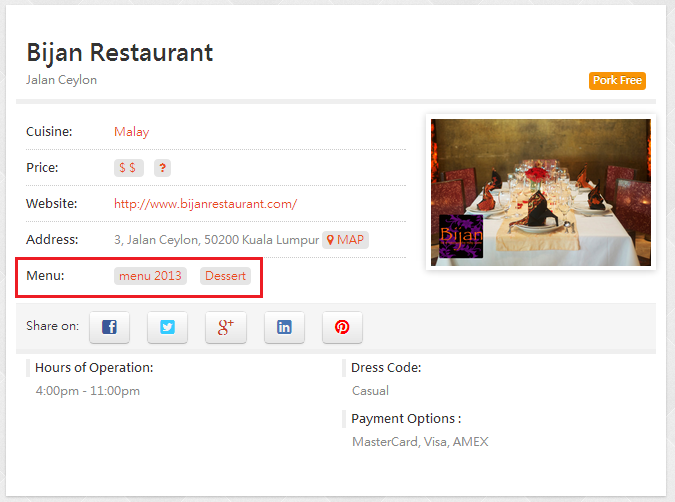 Refering to the image, you can see the red highlighted part is our new restaurant menu feature. You can browse through the menu of the specific restaurant. This can help you decide on whether this restaurant offers your favourite dish or you can always look through their menu to see if something attracts you! To view the menu, just clicked on the category you would like to see and you will be automatically brought to another page which display the menu of your selected choice. You can also browse through all the menu yourself by clicking here. As you can see, there is a "Make Reservation" button now on the right top corner once you scroll down the page. The purpose of this is to help you navigate through our page easier. Once you clicked on the "Make Reservation" button, you will be automatically brought to the top of the page with the "Make your reservation" panel on the right. On the other hand, the "Make your reservation" panel will also be fixed on the right hand side of your screen when scrolling down the page so that users does not need to scroll all the way up once they decided to make a reservation for the restaurant. Want to make a reservation? visit us at www.tableapp.com now! TABLEAPP is an online reservation platform where it does more than help customers secure a place to eat. It also provides marketing for the restaurants that use it,provides reviews, and helps restaurants boost business and manage flow. It also offers exclusive birthday deal to diners as an added incentive to use the restaurants that are signed up. Apart from that, TABLEAPP also provide convenience to people making reservation where they can literally make reservation at 3 a.m, or not wait through a busy signal or go through the litany of questions. The convenience doesn’t just come down to when customers can book, but also they can do so much on one website. They can get all the information they need about where they can get a reservation. It’s a one-stop place for people. TABLEAPP also allows you to keep tabs on who’s dining with you, which means the company can recognize who its most frequent guests are. With those informations, companies can now keep track of what are the preferences of their customers on what they like and what they don't like. For more information, please do visit us if you do have any inquiries.